We are camping right across Europe, into winter in Greece and Bulgaria. 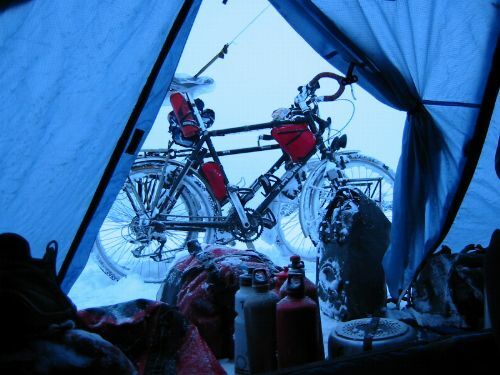 Naturally the gear has to be light and compact, but we also have to be able to live in it day after day, even if rains all the time. Sometimes we will be on campsites, other times we will be camping wild. Our tent is rather unusual one which I should imagine didn't sell well because we got it cheap and they don't make it anymore. 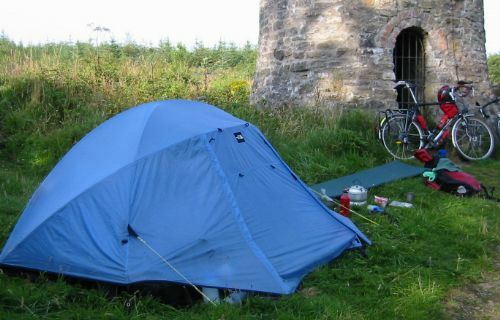 It has quite suitable for us though because the bell end is big enough for all our panniers and has room to cook. It weighs about 3kg which is not the lightest but it is compact enough for everything except the poles to fit into one small front pannier, and it is free-standing so you can use it on hard ground or even in a hotel room. This is useful because the inner is all mosquito netting. It is a North Face Cirrus. 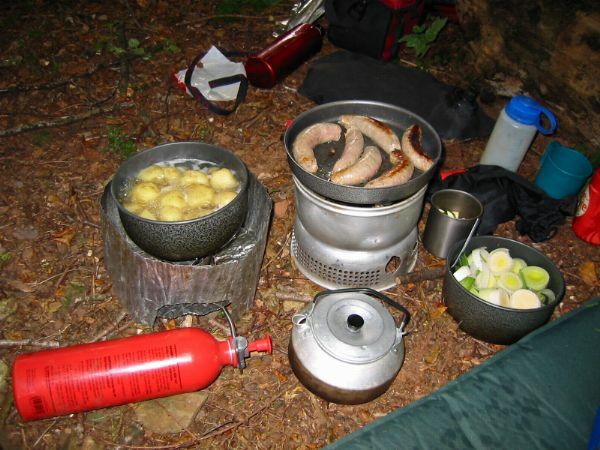 The stove on the left is the MSR, with it's bottle of pressurised petrol. The one on the right is the Trangia. See Ju's "Food" section for recipes and more info on the Trangia. We both have RAB down bags, mine is a 500g bag and Ju's is a 400g one, but Ju's is shorter than mine so they have similar thickness and therefore warmth. You just can't beat down for warmth and RAB bags are amongst the best. We have RAB lightweight duvet jackets too which we wear inside our bags when it is cold. With this arrangment and some extra clothes we have been warm when it was -3°C inside the tent. Ju has a rather nice Mountain Hardwear chair pad, which converts into a seat for festering of an evening. It is rather heavy and bulky but at least it can't pucture. I had a Thermarest but it developed a bubble after less than six months continuous use so now I have a good quality foam mat. See Ju's description of how we added some open cell foam to make it more comfortable. 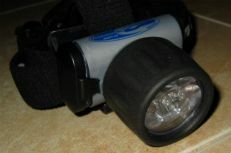 When we get back I am going to make the ultimate extended trip torch, with a fixed rechargable battery that is designed to be connected to a solar or mains charger. 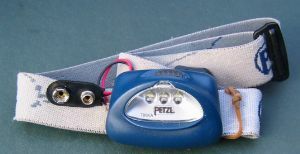 For the time being I have a modified Petzl Tikka with a tatty connector bodged onto it so that the batteries can be recharged in-situ. I'm sure the connector won't last the trip so I hope there's a battery shop in Ulan Bator. Ju's torch is the one on the right, A Princeton Tek Matrix with LED 'bulb'. It isn't very bright, but good enough to cook, read and walk about by and does an amazing 30 hours on a pair of 1800mA rechargable AA cells. Thanks Clive for tracking it down! See Juliette's section on "Domestic life on the road" for how we keep clean, and "Wild camping" for how we find somewhere to pitch our tent.